With this design of method feeder , both the lead in the flat base and the bait load distribute the weight into an aerodynamic bomb shape. this increases casting distance and improves accuracy particularly in strong cross winds. On the body of the feeder the two largest bait holding ribs are well spaced and curved away from each other . This waves a generous gap so the hookbait can be placed in the optimum position. 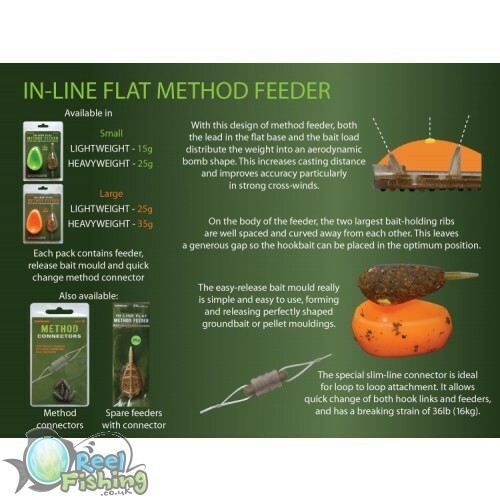 The easy release bait mould really id simple and easy to use , forming and releasing perfectly shaped groundbait or pellet mouldings.